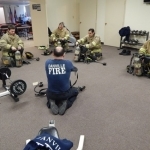 Some new Danville Fire recruits have officially begun their training. The Fire Division of Danville’s Department of Public Safety is back at full strength following the hiring of eight new firefighters this month (during January). Four of the new hires were undergoing air pack training today (Thursday) being taught by fellow firefighters. 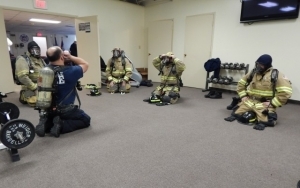 Assistant Chief Todd Spicer describes some the training the men will be undergoing…. Spicer says half of the new recruits have previously gone through training at the Fire Academy at the University of Illinois. The other four will also be sent to the Academy. It had been more than five years since a new firefighter was hired in Danville. Spicer was asked how it feels to be back at full strength…. 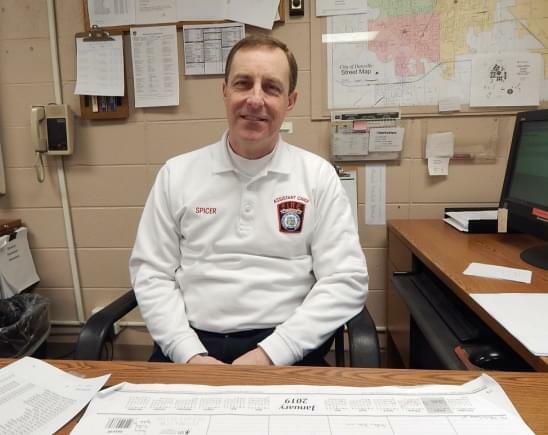 Assistant Chief Spicer adds that being a Danville Firefighter can be a very rewarding career…. Two of the new firefighters have just been hired to replace two who retired earlier. The other six were sworn in earlier in the month after being hired with the help of a federal SAFER grant.